Using clustering to explore the relationships between trending topics. Until recently, I’ve been limited to working with tools provided by other people. But in the last month or so I realized that it’s easier than it used to be to build these things yourself, so I gave myself a crash course in MySQL and R, with a bit of guidance provided by Ben Schmidt, whose blog Sapping Attention has been a source of many good ideas. I should also credit Matt Jockers and Ryan Heuser at the Stanford Literary Lab, who are doing fabulous work on several different topics; I’m learning more from their example than I can say here, since I don’t want to describe their research in excessive detail. I’ve now been able to download Google’s 1gram English corpus between 1700 and 1899, and have normalized it to make it more useful for exploring the 18th and 19th centuries. In particular, I normalized case and developed a way to partly correct for the common OCR errors that otherwise make the Google corpus useless in the eighteenth century: especially the substitutions s->f and ss->fl. The other words that correlate most closely with “diction” are all similarly drawn from the discourse of poetic criticism. “Poem” and “stanzas” have a coefficient of 0.82; “poetical” is 0.81. It’s a bit surprising that correlation of yearly frequencies should produce such close thematic connections. 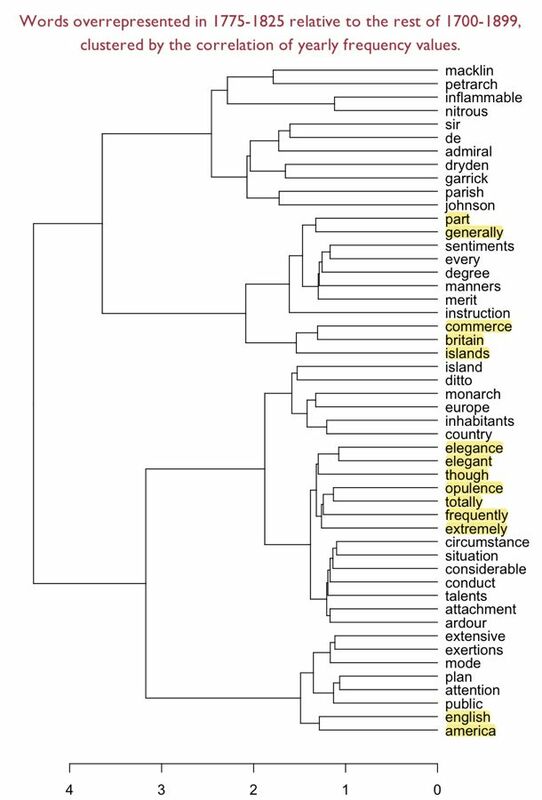 Obviously, a given subject category will be overrepresented in certain years, and underrepresented in others, so thematically related words will tend to vary together. But in a corpus as large and diverse as Google’s, one might have expected that subtle variation to be swamped by other signals. In practice it isn’t. 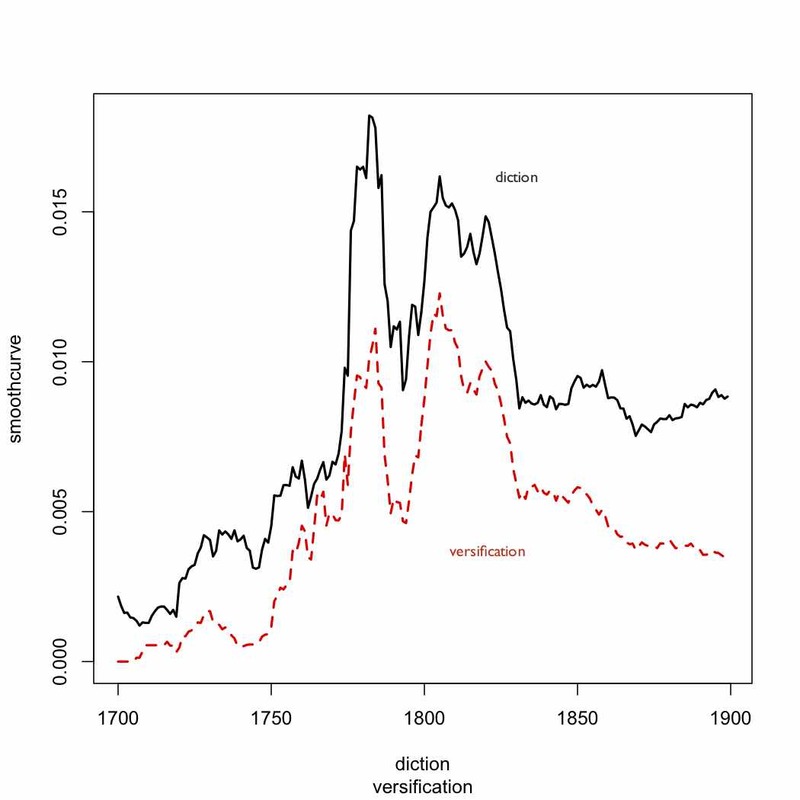 I’ve also built a module that looks for words that are overrepresented in a given period relative to the rest of 1700-1899. The measures of overrepresentation I’m using are a bit idiosyncratic. I’m simply comparing the mean frequency inside the period to the mean frequency outside it. I take the natural log of the absolute difference between those means, and multiply it by the ratio (frequency in the period/frequency outside it). For the moment, that formula seems to be working; I’ll try other methods (log-likelihood, etc.) later on. Once I find a list of, say, fifty words that are overrepresented in a period, I can generate a correlation matrix based on their correlations with each other, and then do hierarchical clustering on that matrix to reveal which words track each other most closely. In effect, I create a broad list of “trending topics” in a particular period, and then use a more precise sort of curve-matching to define the relationships between those trends. One might imagine that matching words on the basis of change-across-time would be a blunt instrument compared to a more intimate approach based on collocation in the same sentences, or at least co-occurrence in the same volumes. And for many purposes that will be true. But I’ve found that my experiments with smaller-scale co-occurrence (e.g. in MONK) often lead me into tautological dead ends. I’ll discover, e.g., that historical novels share the kind of vocabulary I sort of knew historical novels were likely to share. Relying on yearly frequency data makes it easier to avoid those dead ends, because they have the potential to turn up patterns that aren’t based purely on a single familiar genre or subject category. They may be a blunt instrument, but through their very bluntness they allow us to back up to a vantage point where it’s possible to survey phenomena that are historical rather than purely semantic. I’ve included an example below. The clusters that emerge here are based on a kind of semantic connection, but often it’s a connection that only makes sense in the context of the period. For instance, “nitrous” and “inflammable” may seem a strange pairing, unless you know that the recently-discovered gas hydrogen was called “inflammable air,” and that chemists were breathing nitrous oxide, aka laughing gas. “Sir” and “de” may seem a strange pairing, unless you reflect that “de” is a French particle of nobility analogous to “sir,” and so on. But I also find that I’m discovering a lot here I didn’t previously know. For instance, I probably should have guessed that Petrarch was a big deal in this period, since there was a sonnet revival — but that’s not something I actually knew, and it took me a while to figure out why Petrarch was coming up. I still don’t know why he’s connected to the dramatist Charles Macklin. This entry was posted in 18c, 19c, methodology by tedunderwood. Bookmark the permalink.